Sometimes I’m bursting with appreciation for the graphics that atheist people post on the Internet. They often present Heaven-sent opportunities to tell people what God and Jesus Christ are all about. 1. God sends NO ONE to Hell. People send themselves to Hell through the wrong things they’ve done and through the right things they’ve failed to do. That includes kicking God out of our lives and turning our backs on His gift of Jesus (whom serious Christians, and many others, believe is His son). 2. 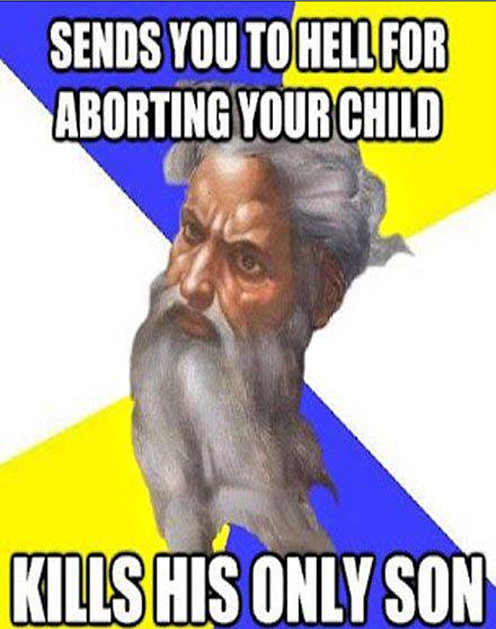 Even if you ignore my first point, who says God sends everyone to Hell for having an abortion? This graphic conveniently ignores the fact of forgiveness. Please note: this isn’t a scam we can pull on a dimwitted creator. This is serious business and I explain it in detail here: http://wp.me/p2wzRb-8n. 3. “Kills His only Son”. First of all, it was Roman authorities who did the killing. They were urged on by manipulative religious authorities who felt threatened by Jesus, His popularity and His disregard for their petty religious rules and regulations. Secondly, God allowed Jesus to die because a significant part of Jesus’s mission — many Christians would declare it was the most important part — was to be a sacrifice that would make up for all the wrong things we’ve done and all the right things we’ve failed to do. Well, it would do that for everyone who accepts the gift of Jesus. For the people who accept that gift, who declare Jesus to be their lord, their saviour and their best friend, God no longer sees our “sins”. He sees only the perfection of His Son. Why was a death necessary? Because this “sinning” business is deadly stuff, far more lethal than most of us truly understand. And nothing we can do or say or think or pray can make up for all the wrong things we’ve done and the right things we’ve failed to do. All our efforts will always fall short. Always. So God did the heavy lifting for us by offering the gift of His Son and his sacrifice. So carefully consider everything our culture tells you about life, about right and wrong, about how we should live and about what happens after this life ends. Does it make complete sense in light of a God that loves YOU, offers the gift of Jesus to YOU and wants YOU to spend eternity in Heaven with him? Yes or no, post your thoughts below and let’s have a conversation.